The proud cultural heritage and topographical diversity of the state of Karnataka along with the sun kissed beaches of the tiny emerald of Goa is what is at display during the 7 nights and 8 days itinerary of the Golden Chariot named the Pride of the South. 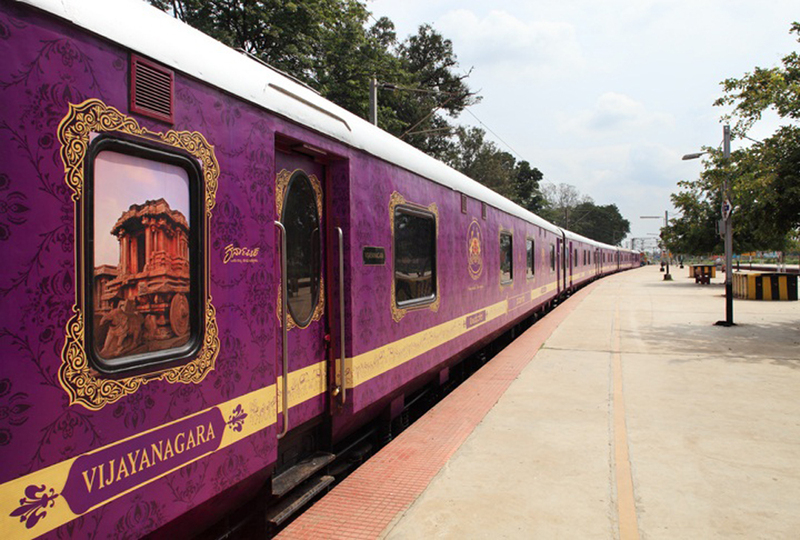 Beginning from the Garden City Bangalore, this luxury train crisscrossed fascinating terrains traveling through lush landscapes near Kabini and from their on the train travels to a series of heritage and architectural sites that includes the royal Mysore, heritage Hassan, Hospet and Badami and then on to the creamy beaches of Goa. Throughout the journey, the atate of the art amenities, impeccable hospitality and cozy interiors keep you pampered on board as you travel hassle free from one facinating destination to other.